Two random thoughts occurred to me today, random thoughts that are too large for a tweet, but far too unsubstantial for a blog post. Under normal circumstances. But it's been over a year since my last post, so these thoughts can also serve to breathe a bit of life back into this site. Someone needs to come up with better names for claw foot and hammer toe. I bought new running shoes today and overheard the sales person warning another customer about the impending doom that would befall her foot. Her face literally dropped when she was told continuing to wear heels would turn her foot into a claw. Side note, someone should come up with a better name for rhinoplasty as well -- I mean, these guys are already self-conscious, do you really need to compare their noses to a rhino's? It must be weird sometimes to be a dog owner. I was in an elevator today and watched multiple people come in and out, greeting the dog that was there, making faces at the dog, talking to the dog, ... all without looking at or even acknowledging the existence of the owner. That's gotta get to you after awhile, that your dog might be more approachable and likable than you are. It's been awhile since I've posted, but I have good excuses! In the last 3 months I got married, went on my honeymoon, and then moved to Zurich. The first step was to find a panoramic image of Zurich that's available for reuse. I used Google's advanced image search page, selecting the "labeled for reuse with modification" under "Usage Rights". Searching for [zurich night panorama] found this amazing photo, shared under Creative Commons license by Paul Stocker (paalia). The header.center_image should be 175px in height, while the width can be as much as you want -- iGoogle will automatically crop the width based on the user's window size. 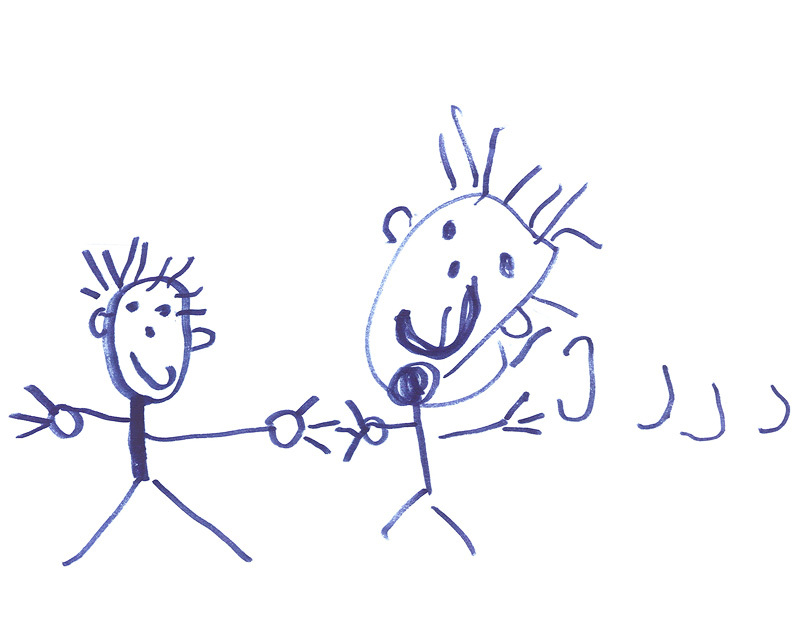 An important constraint is that this image has to be less than 40kB. 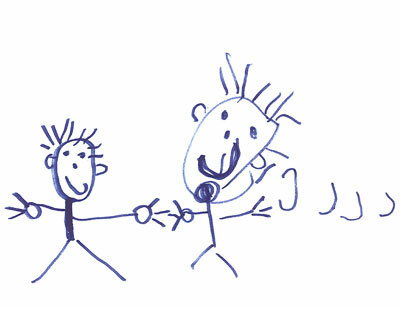 The thumbnail image is what appears in the search results of the theme directory and should be 410x70. The screenshot is what appears on the details page and should be 680x116. a stamp from upstairs and brought the envelope to us. I believe that's me on the right. (Now is probably the right time to reveal that my superpower is sonar.) I couldn't be prouder right now -- not just because I'm uncle to such a talented artist, but because I'm pretty sure I'm the first person to receive mail from him. I was thinking about genius the other day -- you know, how some individuals have been able to write sonatas even as they're going deaf, or understand how the world works in ways no one else has, or still throw no-hitters at age 44. And then I started thinking about skill development in general, how it seems like certain things tend to come more naturally for some, while those same people have a harder time with things that are easy for most everyone else. Generally speaking, it seems like proficiencies in one area tend to imply deficiencies in others. That thinking led me to a theory about poker chips. Actually, it's more of a metaphor. And I should add that it's based on pretty much nothing except my own observation and imagination. But for some reason, it makes sense to me. It goes like this. When each of us is born, we're given some amount of poker chips. There's some average across all people (let's say it's 100) and chips distribution follows something approximating a normal curve with a pretty low standard deviation. So 95% of the population gets somewhere around 90-110 chips. But how many chips we get is just one part of it. There's also the question of what kind of chips we get. Some people get more math chips, so calculus comes easier to them; others get more music chips and magically have perfect pitch at the age of 11; others get more empathy chips and either make a lot of friends or become salesmen; and so on. I imagine the types of chips are actually finer-grained than this, but you get the idea. The chips we get don't map directly to our talents. Rather, they map to our capacity, our potential for talent in those areas. It's up to us to then realize that potential. This theory metaphor accounts for geniuses, who are only a small subset of the 2.5% with more than 110 chips. In that group, the real geniuses are the ones who not only get a bigger pile of chips than everyone else, but also get nearly all the same type of chip. Mozart's 200+ music chips meant he could start composing at age 5. Einstein's 200+ physics chips meant he could intuit the general theory of relativity. For the rest of us, my sense is it's more important to figure out what kind of chips we have instead of trying to determine whether our pile has 93 chips or 107. Because in an area where we have more chips, that means we'll get a higher return on the time we invest in building that particular skill. Obviously, self-awareness is no easy feat, but it seems pretty worth the trouble to attain it. Like I said, this is all just a product of my imagination. And I'm not sure how far this metaphor will really stretch. (We may have already reached its limits.) But it seems right to me at some level, so I thought I'd share. "Wouldn't it be wonderful if we could travel through our lives without encountering people who bring us down with their demeaning remarks and actions? This book is aimed at weeding out those folks and at teaching them when they have stripped others of their esteem and dignity ... it's your job to help build and shape a civilized workplace. Sure, you already know that. But isn't it time to do something about it?" That all sounds goods, but the book describes how organizations often glorify assholes. Oftentimes, the more right you are and the more often you win, the bigger jerk you can be -- success, intelligence, and talent makes you harder to replace, so your destructive behavior is tolerated or even pampered. There may even be the thought that people are effective because they're jerks. "Fight as if you are right; listen as if you are wrong." (courtesy Karl Weick) Confrontation, disagreements, and direct interaction are important, so teach people how to do it right. Make a conspicuous example of the rule-breakers. As research by Cialdini and others suggests, people actually respond better to social norms when good behavior has a clear contrast to "deviant" behavior. The frequency of "we" vs. "I" is a good test. Peter Drucker once said that the most inspiring and effective leaders he encountered had a few things in common, including, "They thought and said we instead of I." "Learned optimism" can help in times when you encounter assholes. Per Martin Seligman's research, you can become more resilient to these situations by framing difficulties as temporary and not your fault, and as something that will not pervade and ruin the rest of your life. The book also mentions a research project from the MIT Media Lab called the Jerk-O-Meter that analyzes tone of voice and speech style to give real-time feedback on whether you're "being a jerk" on the phone. It's not clear that tools like that will prove effective in a broader context, but it can't hurt to keep trying new things that might increase self-awareness and help us police ourselves from engaging in negative behavior. 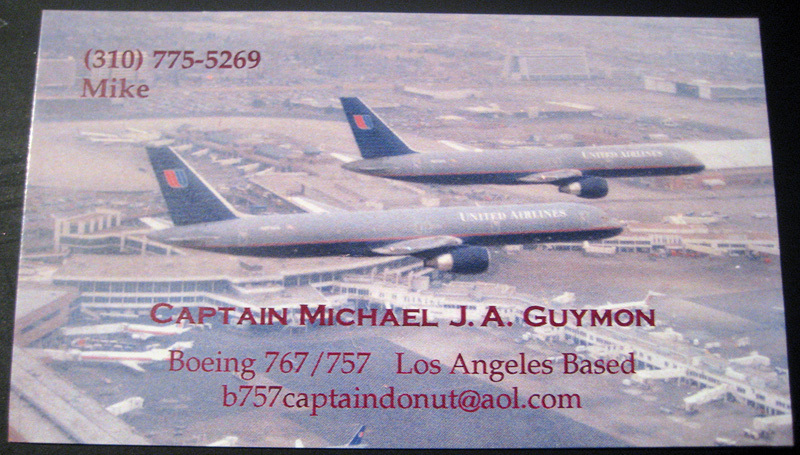 Airlines pilots handing out Captain Donut cards on flights? This is a first for me and I'm not sure what to make of it. 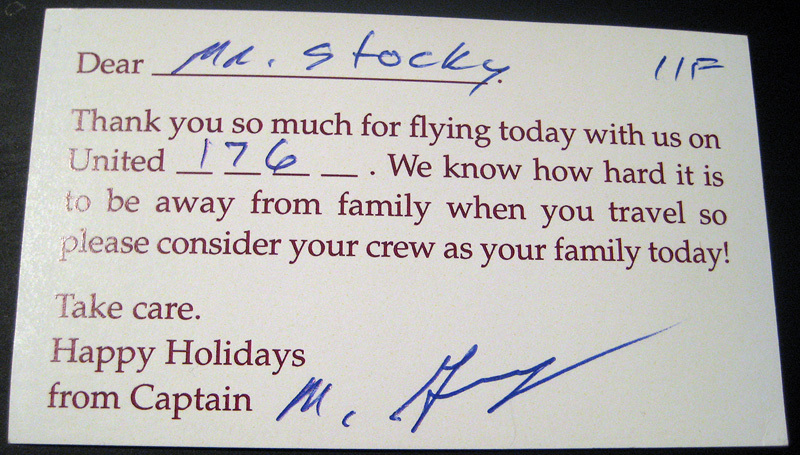 As the card was delivered, we were told it was "from the captain." He or someone else took the time to write everyone's name, seat number, and flight number on there -- using the blank spaces provided, which indicates he's probably doing this for multiple flights. 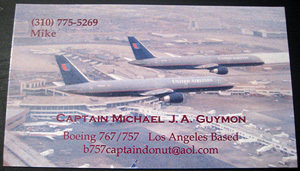 In case you missed it, note the "Captain Donut" @aol.com email address and 310 area code phone number. 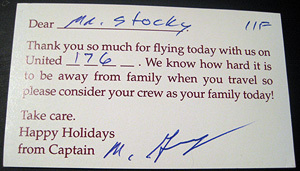 I'm guessing this isn't an official program United is doing, but perhaps they encourage pilots to make personal connections with customers like this? One of the things on my ever-growing list of weekend projects was transferring over my old VHS and cassette tapes to digital video and audio. It took my a bit of research to figure out a good way to do this, so I figured I'd share. Caveat: This isn't actually comprehensive enough to be a "how to" guide; it's just one way to do it that happened to work for me. Get an A2D video Converter. After reading assorted reviews, I narrowed it down to the Canopus ADVC series or the EyeTV 250 Plus. The EyeTV was tempting because it had a built-in TV tuner as well, but in the end I went with the ADVC110 because it's generally considered to produce higher quality picture quality and A/V synchronization. Use the FireWire port. The ADVC110 supports RCA or S-Video input, so you can use whichever your VCR supports. You'll need to use RCA input for audio. Use the FireWire output and plug that into your computer's FireWire port. Capture using iMovie. In iMovie, flip the switch over to the camera icon and click "import." Then push play on the VCR. Once the video's done, stop the importing in iMovie. There's a good video that walks through these settings. You want to create .mov files -- I tried .avi, .mp4, etc with the built-in codecs and they were all visibly worse and larger file sizes. (I also found this comparison that shows video clips in various formats.) If you want to create a DVD, you can export directly to iDVD instead. Install Audacity and the LAME MP3 encoder. I chose this one because it got universally positive reviews and it's free. (There are versions for Mac, Windows, and Linux.) The Audacity docs have a good how-to for installing LAME. Use the "microphone in" port. Your computer will have a (most likely green) mini-plug input somewhere that's usually labeled as being for a microphone. Take the RCA cable from your cassette player output, have it adaptify to a mini plug (courtesy #2) and put it in that microphone jack. Record using Audacity. After a little fumbling, it's pretty self-explanatory, but there's good documentation if you run into any trouble. You'll probably need to split your recording into separate tracks, crop them appropriately, and perhaps increase or decrease the sound level. Export to MP3. This isn't the only export option, but it's a good one for importing to iTunes, which then makes it easy to burn CDs. Media RSS continues to get consumed in more and more places, from sites like FriendFeed to embeddable widgets like this slide show based on the Google AJAX Feed API. So I thought I'd use it to add thumbnails to my site's Atom feed. It turned out to be surprisingly easy -- I just had to include a <media:thumbnail> element in each <entry> with an associated image. My nephew (yes, the same one who gave me marriage advice earlier) has since turned 12. Recently, he's been trying to convince some of his relatives to move to San Francisco. It has enough crime to be interesting; for example, Al Capone and Alcatraz. There are different places to go depending on what kind of weather you like. It's sunny in the south. It's rainy in the north. It's in the middle in the middle. The pollution blocks the sun from getting in your eyes. Actually, this list is cut short. There was a 4th reason as well: "I live here!" And it makes sense that he does, given the convincing arguments. On a recent flight, I was hungry enough to purchase one of the snack packs. I couldn't help but notice the fine print on the cheese packaging. 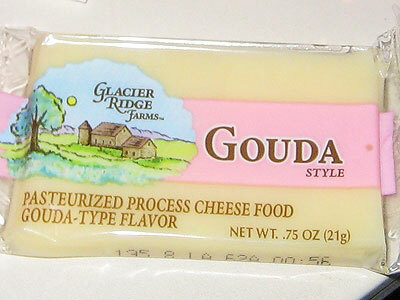 I'm not sure what's worse, that they're calling their product "pasteurized process cheese food" or that they're headlining it as "Gouda style" with a "Gouda-type flavor." 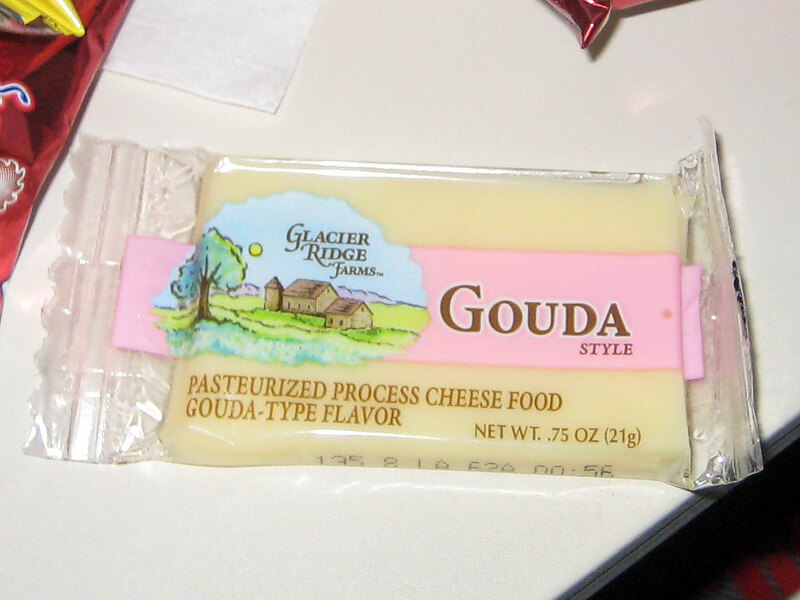 In case you're wondering, according to the ingredients on the back, it was actually Cheddar.